This is the story of inn-keepers who became maître d’s… At the end of the vibrant 19th century, all of Europe was on the move to see the sun rise over the Alps. With the demons of the past giving way to an appreciation of mountainous wonders, the small inns of the pioneers could not handle the mass of travellers turned tourists. On lake sides and bluffs with panoramic views, hotels and palaces sprang up. A new era was in the making, that of mountain vacations, finally offering a pleasurable stay after the arduous travel. At the end of the 19th century, a shrewd inn-keeper in the upper Maurienne valley was of the opinion that the mounting passion for the Alps signalled a bright future for tourism. The hotel he built quickly became a renowned vacation spot, highly appreciated by a steady flow of guests. It was a family affair, evoked here by one of his descendants. « Luxury in wondrous calm ». The mountain paradise sought after by urbanites does not necessarily correspond to local realities. The theoretically ideal setting where vacations take place, mountain resorts must offer fantastic landscapes in a welcoming and un-urban environment, combining the smells and tastes of the high pastures with unequalled comfort. Modern vacation culture conjugates in the present a number of concepts modelled by history and based on a certain vision of the past. The « chalet » is one of them. A rapid look at the evolution of the word « chalet » reveals the history behind a cultural icon. The massive silhouette of the Matterhorn was still years away from illustrating tin boxes for chocolate when a man arrived at the foot of the mountain. Alexandre Seiler was not a « local », and he wanted to establish in Zermatt a high-class hotel that was to produce upheaval in the peaceful hamlet and among the rugged inhabitants. A fierce struggle. In less than a century, mountain resorts have gone from snow-bound palaces to ski factories. Though often criticised, our winter-sports resorts, which have since become all-year mountain resorts, correspond perfectly (and in a variety of manners) to the needs and interrogations of a era. Guy Rey-Millet was one of the participants in this unprecedented economic development of mountain regions. He justifies here a number of unorthodox, but well thought out, choices. Low-end high-rise tenement buildings are not to be found in mountain resorts. Contrary to a common impression, the architecture and urban planning of recent mountain resorts are not simply the product of crass promoters or the transfer of large urban units to the summits. From the design stage to construction, follow the history of these icons of modern architectural thought which have already been ranked as works of art. 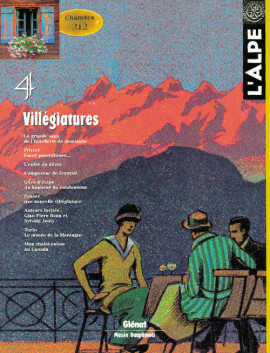 The French « gîte d’étape » system (simple overnight inns on hiking trails) has no equivalent in the other Alpine countries. There is not even a good translation for the term in German or Italian. That is essentially because it is a new concept, invented after May ’68, to hide the fact that France had not, until then, put very much effort into encouraging rural development through tourism, particularly in small units. En route to the Bernina, a psychic child foresees the terrible conflict bearing down on Europe. The last beautiful days of a pre-war vacation in Saint-Moritz draw to a close. Many years later, the outdated charm of the spot brings back the visions, the memories and the nightmares. Way up on the mountain, stood a beautiful chalet… a postcard perfect chalet. But just a run-of-the-mill postcard that, viewed with loving eyes (for men and their kind) and reinvented in the mind of the ethnographer, reveals the secrets of many mysteries. Can a mountain palace, stranded like a tremendous silent ship before an ocean of lofty peaks, put a spell over the foolhardy traveller who dares cross its threshold ? Or is it simply a mirage caused by the altitude, an author’s fantasy ? Aldo Audisio, director of the Mountain museum in Turin, describes his activity, his desires and his passions, stretching from past to future. Over the next pages, L’Alpe presents in detail the impressive publishing activities of an uncommon professional whose central belief may be summed up in one word : Remember. On a platter of cheeses from Rhône-Alpes, the Savoy region stands out like a mountain… of Beaufort, Reblochon and Abondance cheeses, tommes, vacherins…, all the product of the region’s rugged nature, culture and tenacity as well. However you look at it, the Savoy region dominates the rest to the point of forming a veritable cheese kingdom that could claim its independence and occasionally mutters about doing just that, not without reason. The story of Beaufort cheese, tommes, etc. Throughout the Alps, the purpose of road signs is to signal special characteristics, dangers and good reasons to stop. We read these familiar, yet indispensable signs without really paying attention, even though they have been transformed by a multitude of variations since the old symbol signalling a curvy road, in a long process of adapting to local conditions, particularly in the European mountain regions.